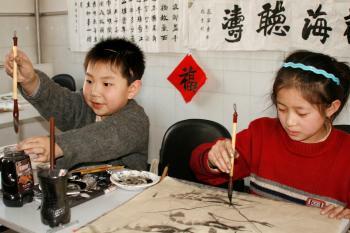 SOS Children's Villages has been working in China since the mid-1980s. Our work developed rapidly all over the country and we have been present in Tianjin since 1987. China has undergone many changes in the decades since, and yet the need to support vulnerable children and families is as pressing today as it was thirty years ago. Tianjin is situated about 100 km south-east of the capital Beijing. According to the 2010 census the city is home to over 12.9 million people. The city is growing at an incredible rate; its proximity to the capital and to the sea, as well as the creation of free trading zones has resulted in numerous companies moving to the area. The urban areas of the city are home to industry and manufacturing. Farming and fishing continue to be present around the city. The rapid rate of industrialisation and urbanisation has resulted in ecological problems - the water is heavily polluted with untreated waste which includes heavy metals and pollutants. This toxic waste not only affects farming and fishing, but also leads to poor health in people living or working near sources of contamination. In spite of the economic development, there is an increasing gap between the rich and the poor and lots of people face hardships in the city and its surrounding areas. Many children, often with a migration background, live in poverty. These children often drop out of school as they have to work to contribute to the family's income. They beg or peddle small items in the streets. Their situation makes them vulnerable to commercial and sexual exploitation, violence and abuse. Many have already lost parental care, while others are at serious risk of losing it. In 1991, China signed the UN Convention on the Rights of the Child, and has since launched several programmes to improve the lives of children. With China's economy opening up to the West and more and more people migrating to the Tianjin area, the need for our work in the area became increasingly evident. SOS Children's Village Tianjin is based on the eastern outskirts of the city, in the district of Hedong. SOS Children's Villages provides different kinds of assistance to the local population: support to vulnerable families and children in crisis situations, day-care for pre-schoolers, and loving homes for children and young people who have lost parental care. Our organisation works closely with families in the neighbourhood so that they can stay together. In collaboration with local agencies we ensure that children have access to essential educational, health and nutritional services. We provide neighbouring families with medical treatment, counselling and we also support the community according to their needs. Our SOS Social Centre has a gym, library, computer room and seminar rooms which can be used for activities that will build the skills of the local population. Children who can no longer live with their families can find a loving home in one of the 16 SOS families. The children grow up with their sisters and brothers in a familial environment full of love, respect and security. The children from the SOS families attend the local schools, thus helping them integrate. After school the children play sports, take music lessons or receive special tuition for their school work. Until December 2012, SOS Children's Villages run a kindergarten which looked after children from both the SOS families and those from the community. Having a place where a professional looks after their children while they are at work makes life easier for working parents. The families continue to benefit from this service although the kindergarten has now been handed over to the local authorities.